They are our early birds, our heavy-lifters, and our occasional light comedic relief; our esteemed casters. They start their day before the sun comes up to get a jump start on the day ahead. Coffee is a definite must, otherwise we may end up with purple Cats instead of grey. Once alert and daily exercises have been performed, the casters get to work. First things first; ear plugs are a must in the casting room because it is LOUD in there with the cement mixer running and vibrating tables shaking. 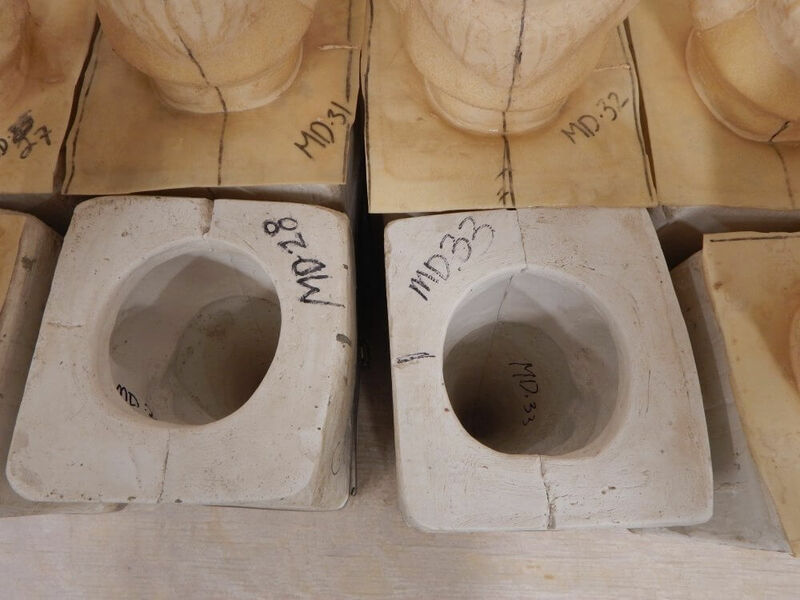 Once the casters receive the production molds, the pouring process commences. A combination of cement, water, sand, and other materials (all purchased locally from the Hahn Company; aka Builders Sand and Cement) are placed into a cement mixer to be prepped for pouring. Watch as Tony demonstrates. Secret recipe; read quickly, this picture will self-destruct in 5…4…3…2…. To achieve the different colors of the sculptures, dye is mixed in with the cement using a “secret” recipe specific to each sculpture. Almost any multi-color sculptures you see in our showrooms are poured in a base color and then finished over with the additional paint to achieve the desired look. After being poured, the sculptures are left to dry in their mold overnight. The plaster “outers” are taken apart in the morning and the latex molds are carefully peeled off the concrete sculpture. If there are any rough edges, those are filed smooth and then placed on a cart to be taken to finishing. Can you spot a “new” design in the mix? On an average day, about 50-60 molds are poured. Some come in plates, like our ornaments, where you can get anywhere from 6 to 10 molds per plate depending on the size. Other, bigger molds are poured one at a time. The number poured depends upon the number of sculptures on the production schedule for that day/week. During the holidays this number increases to meet the demand, thanks to our loyal customers like you! Our casters don’t mind the extra work! Our casters, like many of those working in other departments, all have been with Isabel Bloom for over 24 years! They come with a wide range of talents and skills and help ensure that the process of making an Isabel Bloom runs as smoothly as possible. A few employees, casters included, complete side projects for us, like preparing materials for our fun craft events that we occasionally host at our tour center in Davenport. Sometimes they’ll build furniture for our displays (like this awesome wood tree made from pallet board to hold ornaments, or this cute and functional key holder). A creative way to display your new pineapple plaque! Join me next time as we venture into the bright and colorful world of finishing; the next step in the production process. I have been collecting Isabel Bloom statues since the 8o’s when I lived in the Quad Cities. I am now in Texas and when I return home, I always stop and buy a piece…or if free shipping is involved; I will place an order. My Brother usually visits once a year and he will pick up the larger statues and drive them down. Thank you so much Leah, for being a loyal customer 🙂 Your brother must be a nice guy to drive those heavy ones down for you!